Sorry, if you are looking for how to buy US savings bonds in paper format, we unfortunately cannot help you. Paper savings bonds were discontinued in January of 2012. The only way to buy US savings bonds today is electronically through the US Treasury website, TreasuryDirect.gov. You will need to set-up an account prior to purchasing the bonds. As savings bonds (EE and I Series) are only sold directly by the US Treasury, there are no commissions to pay to a broker when buying US savings bonds. There is however a maximum amount of bonds that can bought per year. You can buy up to $10,000 per bond type, per social security number, per year. In other words, an individual could buy up to $10,000 of EE savings bonds and up to $10,000 of I Bonds in a single calendar year. A married couple without children could buy up to $20,000 of EE bonds and $20,000 of I Bonds in a single calendar year. You can buy US savings bonds in any denomination, starting at $25. You may also enroll in the Payroll Savings Plan, which allows employees to buy US savings bonds in various denominations. Once you decide on a denomination, this amount will be automatically withdrawn from your paycheck and can be used for purchasing both Series I and EE series savings bonds. This program can either be combined with an existing retirement investment vehicle such as a 401 (k) or stand alone. The Payroll Savings Plan is easy to set up and has currently been utilized by over 40,000 employers. Once the program has been activated, Savings Bonds are bought for you, and will continue until written notice is received or when you leave your place of employment. 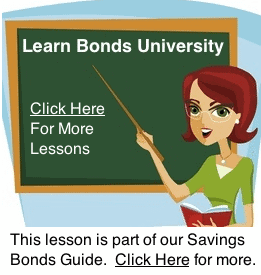 Who Can Buy US Savings Bonds? Corporations, associations, public and private organizations, fiduciaries and of course individual citizens can own U.S. savings bonds. U.S. Savings Bonds are issued to anyone who meets any of the following criteria. Citizen of the United States and living abroad (must have a U.S. address on record however). Civilian employee of the U.S. (regardless of your residence). A minor, unlike many other investments and securities, minors may legally own U.S. Savings Bonds. Savings Bonds are non-marketable securities, which means they cannot be sold from one investor to another. All purchases and sales of Savings Bonds must be done through the U.S. Treasury department.